If you read the last post, you know that Hailey was diagnosed with congenital hypothyroidism. Since then, Hailey has had several more appointments and blood draws. Based on the adjusted dosage, her thyroid hormones went from being too low to too high. Having too much of the hormones can also be an issue. Thus we had to adjust her dose again. As of her last appointment on June 15, her hormone levels are officially in the normal range. Yay!!! 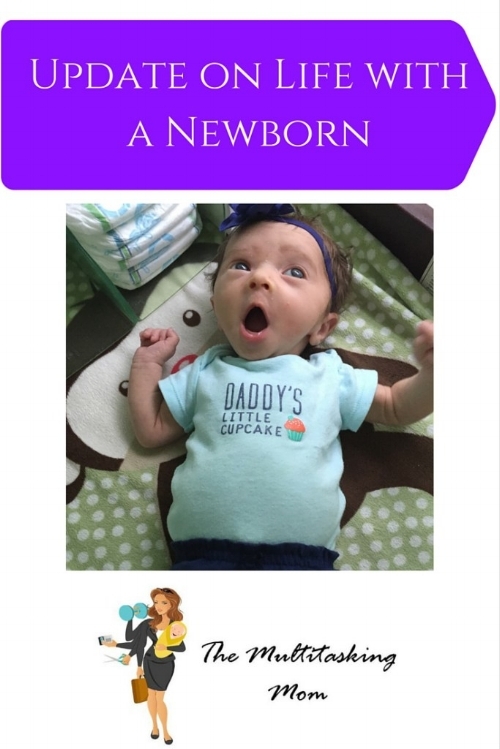 Because Hails is so small and growth at this age is so quick, we will be at the endocrinologist regularly to make sure that her hormone levels stay normal and adjustments in dosage can be made. On June 16, we had Hailey's one month checkup with her pediatrician. In most respects, she is doing well. She had grown half an inch from her birth length and has good muscle tone. The pediatrician was however concerned about her weight. At 5 weeks old, she still wasn't even a full pound above her birth weight. While this can be because of the instability of her hormone levels, the pediatrician wants to make sure that she is now growing on track. Therefore, on the 29th she will be weighed again to make sure she is now growing at the correct rate. Thus, our goal at the moment is to help her put on weight and keep up with her endocrinologist appointments. As far as milestones, she had been picking up her head for a while and even rolled over from belly to back. The fact that the surface she was on isn't 100% flat may have helped. She loves hearing T talk and playing with her toy monkey. Here she is at 6 weeks! In other news, T is adapting well to having a baby in the house. Some days he is vying for attention, but in general he has been a good boy and is super affectionate with Hails. He loves to help with pamper changes and doing tummy time with the baby. Whenever he sees that she is awake he will constantly talk to her and show her his toys. He also makes sure everyone else talks to her as well. He loves copying all the sounds that she makes. When she cries, he repeats what we have said to her to try to calm her down. Hearing my 3 year old say, " it's ok baby girl, I know I know, mama, just calm down and it'll be ok" is priceless. All in all he is being a helpful big brother. As far as mommy care, things are progressing slightly. We have a specific sleep schedule that helps us parents try to maximize our sleep. If my husband is home, after Hailey's 9pm feeding, I change her, put her in her pjs and pass her to him to get her to sleep. If he's at work I try to get her to sleep myself. Once he gets home however, he's on duty if she wakes up. Then after her midnight feeding, it's his job to get her back to sleep. I immediately put myself back to sleep after I feed her. For her 3am feeding I'm on duty again and hubs can stay asleep. Then I have her from 6 am on. My assistant, the T monster is usually up between 7-8 am to help. The hubs is able to stay asleep usually until around 9:30-10ish unless we have somewhere to be earlier. This works for us since a) the hubs is a night person and I'm a morning person (he is generally up late anyway catching up on shows), and b) his work schedule generally has him going in later in the day except possibly on weekends. I am also sometimes able to take a nap during the day if the boys entertain themselves and Hailey is napping. We are super lucky to be able to switch off like this. Other than some weightless arm and leg exercises and some walking, I haven't really been exercising. I just had my 6 weeks checkup however and I am now cleared for everything!! Yay!! 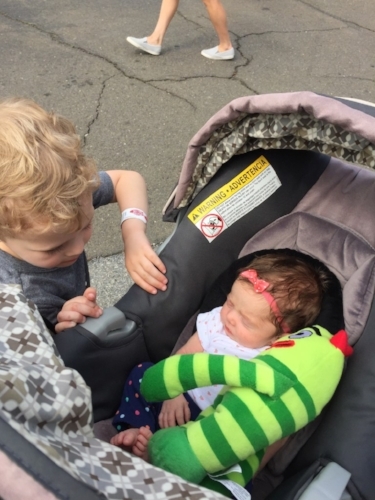 In the past few weeks, we have been able to take the kids to the zoo and the park and a local fair. 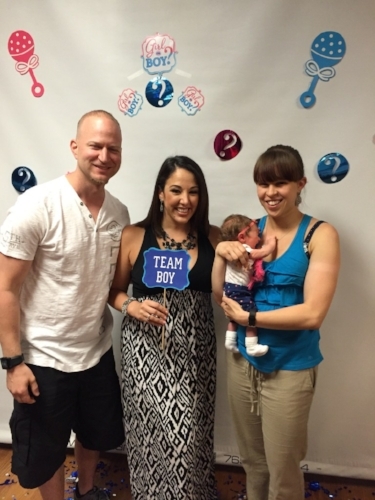 They have also attended a baby shower, gender reveal party, and a baptism. We'll be attending another baptism tomorrow. We have had two bbqs at the house including one for Father's Day. We also had Tyler's dance recital. This was an absolute blast. While Tyler did little to none of the choreography, he never stopped moving. He definitely doesn't have stage fright. He also loved watching the other classes. Thus, at only 6 weeks, Hails has had a pretty busy social calendar. Here are some shots of the past few weeks. Check out the Multitasking Mom Facebook page for a clip of T from dress rehearsal for the recital. He definitely has spirit!! I think that brings us up to date! Check out the blog next week for a 4th of July craft and tips on getting things done with a newborn/baby around.